This class is only open to participants who previously participated in a full year of Ricky's 52-Week Photo Challenge. • The critique group runs for the year - 52 weeks of challenges. PLEASE READ ALL THE FOLLOWING INFORMATION CAREFULLY. Ricky Tims leads the final Part 3 (13 weeks) of the three-part, 52-week digital photography class. It is a prerequisite that participants were enrolled in the 2018 Parts 1 and 2 of the course. Ricky Tims leads Part 2 (13 weeks) of the three-part, 52-week digital photography class. It is a prerequisite that participants were enrolled in the 2017 Part 1 course. PLEASE READ ALL THE FOLLOWING CAREFULLY. Ricky Tims leads Part 3 (the final 13 weeks) of the three-part, 52-week digital photography class. It is a prerequisite that participants were enrolled in the 2017 Parts 1 and 2. This class is only open to participants who previously took Ricky's 52-Week Photo Challenge. Ricky Tims leads Part 3 (the final 13 weeks) of the three-part, 52-week digital photography class. 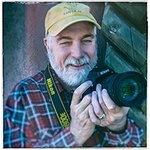 Ricky Tims leads Part 2 (13 weeks) of the three-part, 52-week digital photography class. This is an information page only. The Workshops listed below are not purchased here. Links to details and registration are below. You have found the online photography class website of Ricky Tims. Here you will find a variety of classes covering topics on camera techniques, themed lessons, using Lightroom and Photoshop, as well as classes on design and composition. This new site launched in November 2015 with limited class offerings, you will find that new classes are constantly being added. Check back often to see what's new. Ricky Tims has successfully blended his creative passions into one very unique and interesting artistic career. He is well-known in the international world of quilting as an encouraging teacher and inspirational speaker. His skills as a pianist, composer and producer have been evident by the thousands who have heard his music (search iTunes). Photography is one of his significant artistic disciplines. To learn more about Ricky Tims visit www.rickytims.com, www.rickytimscreative.com, www.thequiltshow.com, and www.letsquilttogether.com.